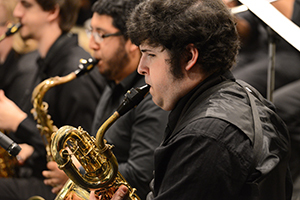 Lamar University's Cardinal Jazz Orchestra will perform its fall concert on Thursday, Oct. 13, at 7:30 p.m., in the Rothwell Recital Hall. The program will feature fresh big band versions of such standards as Cole Porter’s Love for Sale and Simon and Garfunkel’s Bridge over Troubled Water. The orchestra will also perform original material by some of America’s most well known composers of contemporary big band music, including Gordon Goodwin, Bob Florence and Patrick Williams. Admission is free. The ensemble, under the direction of Associate Professor Rick Condit, has performed regularly throughout the region and has recently hosted several guest artists, including the United States Air Force Airmen of Note, the Stan Kenton Legacy Orchestra and trumpet legend Allen Vizzutti. In June, the ensemble was selected by a blind audition to perform at the upcoming 8th Annual Jazz Education Network Conference in New Orleans. The conference, held in a different city each year, is expected to draw in excess of 3,500 attendees in January 2017. For more information, call the Mary Morgan Moore Department of Music at (409) 880-8144 or visit lamar.edu/music.